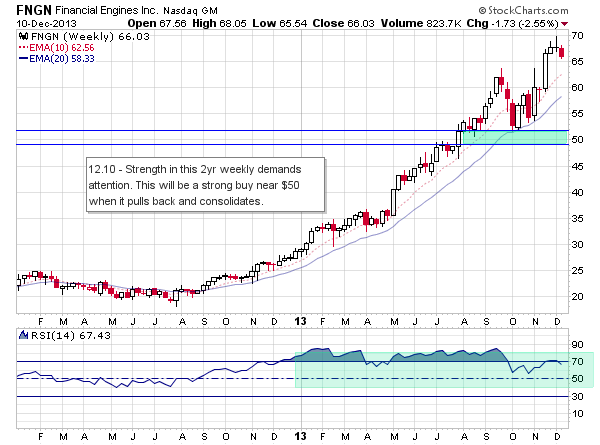 Financial Engines Inc (FNGN) is a stock I’ve never come across in all my scanning so I often pay close attention to these stocks. This stock has had quite a run over the last year and a half and I think it’s time for this to take a pause as it’s got several timeframes of negative divergence on the RSI and just looks tired. Let me put that another way. It could clearly continue going up, but the reward/risk is nowhere near favorable so I will watch until it has a pullback. I will get interested in this stock near the $48-52 range and it will likely take a few months of orderly declines for this to set up properly, but definitely keep this on your radar.